So you already have all of the official UMass items from the bookstore already? How about getting some BCT T-Shirts and UMass business cards then? Get a personalized BCT hardhat that features the BCT logo on the front and your name on the back. Contact the NAHB student grouop if you are interested or check out their info page for additional contact information (it’s actually a fundraiser for them). A sample hardhat is shown in the image on the right. We also have BCT T-Shirts available for sale through the NAHB student chapter. The shirts look like is shown on the right and you can always purchase one (or more) from the NAHB student chapter officials. Contact the NAHB students if you are interested or check out their info page for additional contact information. UMass Print Services sells business cards to students that you can for example use at conferences or job fairs. 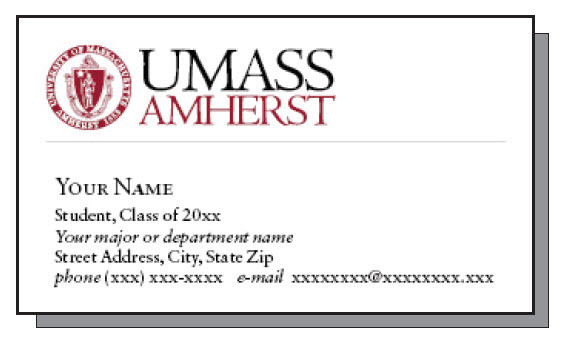 There are undergraduate student cards (shown in the image on the right) and graduate student cards (similar to the regular UMass business card). If interested, use the following forms to order them for yourself (100 cards are approx. $30). Print Services asks to NOT submit your credit card information on the form and rather call them after your order with that information.